Best Cryptocurrency Under a Penny: Maybe you are looking for some best cryptocurrency to invest in 2018 that may give an awesome return in 2019. This article will discuss some Best Cryptocurrency Under a Penny. The list contains the ‘5 Best Cryptocurrency Under a Penny’. Did you miss the first era of cryptocurrency? Don’t worry! this list of best penny cryptocurrency will help you to gain a return of 10x by the mid of 2019. We know the cryptocurrency market is gaining momentum and the 3rd generation of blockchain have entered the market. The market needs more project that can help it in gaining further momentum. This list of top 5 cryptocurrencies are not mere cryptocurrencies. The list contains the new amazing project from the world of cryptocurrency. These projects aiming to help the blockchain industry in attracting users around the world. Ethereum is already doing the same job but the issue is with scalability. Furthermore, Ethereum is not able to host a big decentralized application. We a need a more secure and powerful platform and Zilliqa is here to help the people around the world in building more powerful and secure applications. The official website of Zilliqa is claiming the platform will have 10,000 transactions per second. We know Ehereum is not capable of carrying that much transaction and we need a more powerful platform. Pundix is another amazing addition to the best cryptocurrency under a penny. Now, people will be able to buy cryptocurrency like purchasing a bottle of water from the shops. Yes, Pundix is coming with physical devices that will help the users in purchasing cryptocurrency from physical stores. The Pundix device is already available in market helping the people in purchasing cryptocurrency without going to any exchange. Pundix is also going to enhance the bitcoin transaction speed by introducing the concept of sidechain technology where the user will get faster and safe transactions. Furthermore, people will be able to buy cryptocurrency with XPOS cards or online crypto wallet. XPOS is a physical card that is introduced by the Pundix team. The users will recharge the card and will be able to purchase cryptocurrency. The Pundix is also going to introduce their own platform where the user will be able to build dapps. This platform will help the developers in building the decentralized applications with better performance. The Cardano is coming with different and better blockchain and the purpose is to take over the Ethereum platform by providing more scalability. Currently, Cardano is also the “best cryptocurrency under a Penny”. It is the first blockchain platform developed from the philosophy of science and the research-driven approach. The development team consists of a large number of expert engineers and researchers. Iotex is aiming to revolutionize the world of internet of things. People will be purchasing products related to IoT using the Iotex cryptocurrency. Iota was earlier available on the internet for a similar purpose but they are failed to satisfy the customers and to provide the crypto world with scalability. For example, if you want to park your vehicle in an online parking system, the system will detect the vehicle and charge the fee automatically with the help of IoTEX cryptocurrency. The world is moving toward the world of IoT and the IoTeX is here to help the community in the world of IoT. Cardano aims to be the 3rd generation of the cryptocurrency. We know the first generation of the cryptocurrency is bitcoin and Ethereum is the second generation and both these generations of cryptocurrency failed to provide the community with scalability. Another usefull addition the list of best cryptocurrency under a Penny is Holo. HoloChain is entering the world of cryptocurrency with the amazing concept. Perhaps you have already heard about the blockchain. The Holochain is totally different from blockchain. We can say better blockchain. The aims to provide the world with a new platform where the user can develop more scalable dapps. Dapps are required more scalable platforms and holochain is here to help the world in making better-decentralized applications with completely new concepts. In future, the world will be migrating from blockchain to holochain. Where more privacy and more security will provide the key to the success of the cryptocurrency world. You can buy these cryptocurrencies Binance. I hope this list of best cryptocurrency under a penny in 2018 will help you out in finding the best suitable cryptocurrency for you. 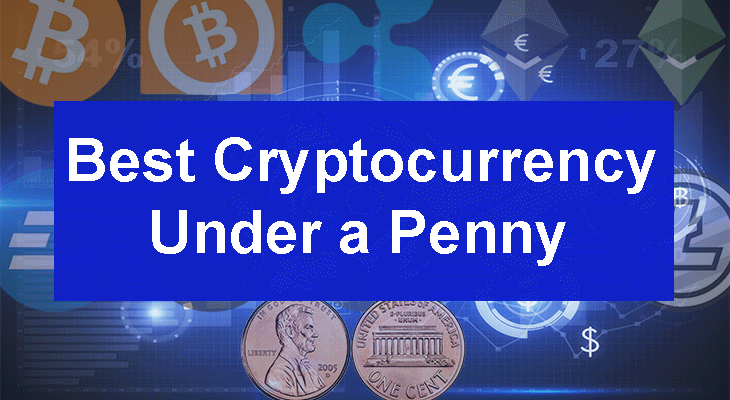 The list of penny cryptocurrency is amazing and after completely exploring each and every project mentioned here, you will be in love with these project. I am sharing this list of top 5 cryptocurrencies in 2018 after a thorough research. But at the same time, I’m not a financial adviser. If you are going to invest in any of these projects, you can go for it on your behalf. Cryptocurrency market is very risky and only park your money in this market if you have some extra money. According to experts this list of top cryptocurrency is the best one in 2018. These projects can give a 10x return during the bull run. If you are going to park your money in cryptocurrency, go for it and find the best suitable project for you. But again, do your own research. Never trust someone blindly. Consider subscribing to blog for more!